Occasionally I come across a pattern which I adore and just want to make over and over again. It's called Reversible Strands and has been favorited on Ravelry almost 8000 times so evidently other hookers are loving this pattern as much as me! The swirling lines of the cable / front post stiches are very pleasing to me. 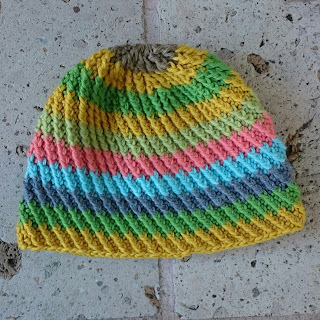 I haven't exactly followed the pattern, I almost never do, but I am very happy with the resulting hats that I will give as gifts. The bright one is for one of my dearest friends in the UK and I made a more manly one for my brother. I will make more with my Yak & Yarn group for charity. Crochet cables seems very on trend right now. The Fall edition of Interweave Crochet focuses on crochet cables with 10 cable projects and even tutorials for those new to cables from experts. I have also flicked through a copy of the recently published Celtic Cable Crochet by Bonny Barker in the yarn store where I work. The Lavena Poncho on the front cover is even making the knitters want to learn to crochet! It is fantastic! Let me know if you've been making anything with crochet cables recently. And have a great week y'all! Wow! Knitters being attracted to crocheted cables over knitted ones? Well I never! That's impressive. It's a pretty stunning pattern. So hurrah for crochet! I'm so happy you found my post Nancy. We have been making even more of your reversible strands hats for charity. In fact, my blog post this week is about hats again and has a photo of more of your reversible strand hats ready to be donated to the homeless. We love the pattern! !